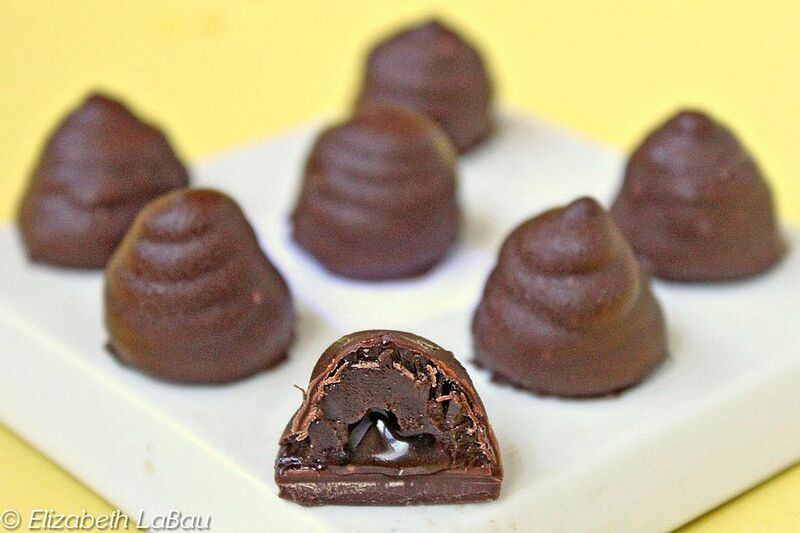 Honey Truffles are the bee's knees! They're made with a sweet honey-chocolate ganache and a surprising pocket of pure honey on the inside. This recipe produces beautiful chocolate-dipped beehive-shaped truffles with a liquid honey filling. This process is somewhat time-consuming, so you can always choose to simply roll them into round balls and dip them in chocolate or cocoa powder instead. Because honey is a major flavor in these truffles, use a honey with a robust taste that will stand out from the chocolate. Place the chopped bittersweet chocolate in a large heat-safe bowl. Put the heavy cream and 1/4 cup of the honey in a small saucepan over medium heat, and heat it until it just barely starts to boil. Pour the hot cream over the chopped chocolate and gently whisk to combine. Don't whisk too quickly, as you don't want to cause air bubbles, but make sure that all of the chocolate has melted into the cream and the mixture is very smooth. Once the chocolate is melted, add the soft butter and whisk until that is incorporated as well. Your ganache should be very smooth and shiny. To quickly cool down the ganache, pour it into a 9x13 pan or a rimmed baking sheet and press clingwrap on top of the chocolate to prevent a skin from forming. Refrigerate it until it is pliable but somewhat firm, about an hour. You basically want to be pliant enough to pipe through a piping bag, but stiff enough to then hold its shape. While you wait for the ganache to chill, make the bases for the truffles. Melt the candy coating in the microwave until it is entirely melted and smooth, and spread about half of it in a very thin layer onto a foil-covered baking sheet. Place the baking sheet in the refrigerator to chill the coating until it is almost set. You don't want it to be completely hard and brittle, because you'll be cutting circles out of it and if it's too hard it will simply snap. Once it's nearly set but still a little pliable, take a small 1-inch round cookie cutter and cut 60 circles from the chocolate. If you don't have a small cookie cutter, the bottom of a piping tip often works as an alternative. Pop the circles out, smooth out any rough edges, and set them aside on a baking sheet. Take the remaining coating and put it back into the bowl with the melted coating to re-melt and use for dipping later. Once the ganache has chilled enough to hold its shape, place it in a piping bag fitted with a small round tip--between 1/8" and 1/4" wide seems to work well. Pipe a tall circle of ganache around the outside edge of one of the chocolate circles. I usually go around twice to get the circle high enough to hold the honey that will fill the cavity. Repeat until all of the chocolate discs have ganache "rings" around them. Put the baking sheet in the freezer for 10 minutes to really firm up the ganache. Once the ganache is very firm, pour a little honey in the middle of each ganache circle. Then pipe more ganache on top of that, making increasingly smaller circles so that the final truffles resemble the cone shapes of beehives. It's best to let these set in the refrigerator for about an hour to firm up, but you can speed up the process by freezing them for about 15 minutes. You don't want to leave them in the freezer for too long, as dipping truffles that are frozen solid doesn't produce very good results. While you wait for the truffles to firm up enough to dip, re-melt all of the candy coating until it is smooth and liquid. Use two forks or dipping tools to dip the truffles in the coating chocolate. Place the dipped truffles back on the baking sheet and repeat until all of the truffles have been dipped. Refrigerate the tray to set the coating chocolate, for about 10 minutes. Honey Truffles are best served at room temperature, and they can be stored in an airtight container in the refrigerator for up to a week.